Hospitality means different things to different people. For some individuals in the industry, it’s a simple box-ticking exercise: if you offer warm greetings, a clean space and good food, customers will walk away happy. While that is true to some extent, it’s not the whole story. To understand the intentions of those who offer more, it’s useful to revert back to xenia, the ancient Greek concept of hospitality. The term, which translates as ‘guest-friendship’, refers to the courtesy and generosity given to those who are far away from home. It’s this idea of treating a guest as a friend of the family that shifts the concept of hospitality from a provider-consumer transaction to something more encompassing and genuine. The latter approach can be said of Lauren Berger, the founder and CEO of the Lauren Berger Collection, a company that organises luxury accommodation, as well as yachts, exotic cars and once-in-a-lifetime experiences, for discerning guests. Founded in 1991, the group now offers some 450 properties around the globe, from charming chalets in France to sprawling villas in the Maldives. Its impressive yacht collection, meanwhile, comprises 10 models, including the luxurious Leander and the 73.6m-long Pegaso, which boasts spacious living quarters that are the envy of many a penthouse suite. With such a desirable array of properties and yachts to choose from, it would be easy for Berger to rest on her laurels and let the settings she offers do the talking, but that’s simply not the case. With the concept of xenia at the heart of her business, Berger offers an entirely new class of hospitality. European CEO spoke to Berger to find out more about her unique approach to the industry. What inspired you to create the Lauren Berger Collection? Love, is the answer. 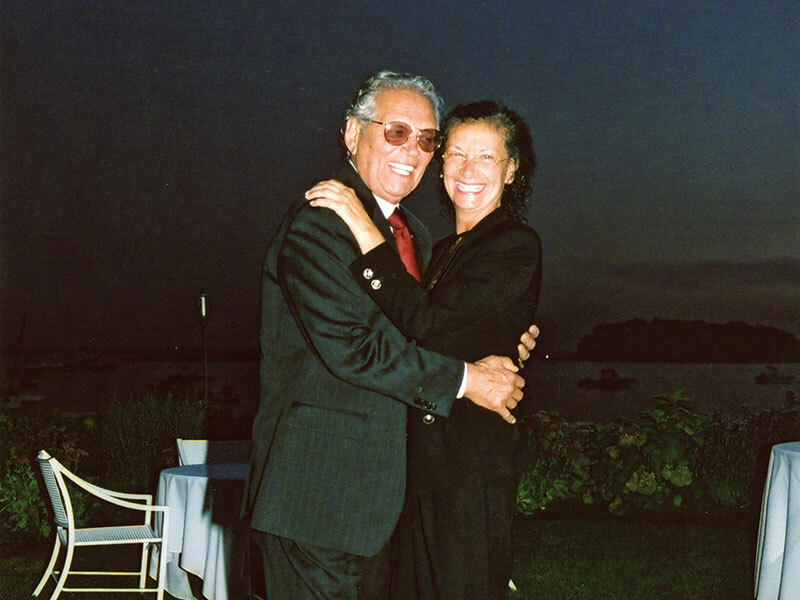 It started when I met my husband, Dr Sidney Berger, who is one of the top dental implant surgeons in the world. He truly loves his patients and takes care of them with every fibre in his body. Many of them are privileged, high-profile individuals who travel to New York from around the world to see him. My childhood played an important role, too. I come from a big, loving family with 11 brothers and sisters. I grew up in New York watching my Greek mother passionately take care of her family and friends, forever making sure everything was perfect – she never settled for less. It was a true privilege watching my mother cater to everyone’s needs, so it became natural for me to enjoy taking care of my husband’s patients with the same passion. After we got married, my husband thought it would be a good idea to buy a home for his patients to stay in while they recuperated from surgery. But it turned into so much more: when Sidney’s patients returned to New York for their continued dental care, they would call on me for their private luxury accommodation. They came to us as patients, but left as family. And so, the concept of the Lauren Berger Collection was born. The company grew quickly through word of mouth, as Sidney’s patients referred their family, friends and business associates. 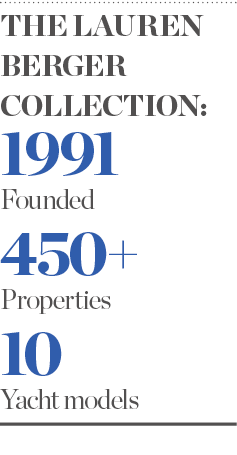 The homes soon grew into a portfolio of 450 hand-selected properties. What makes the Lauren Berger Collection different from other hospitality groups? I have learned everything from my loving parents – my father never took a day off work, while my mother would never stop, even for a breath. Love comes naturally when you grow up with loving parents and then marry a man born to love the world. I share that love with my guests, many of whom have told me they return because it feels like they are coming home when they stay with us. It means the world to me to hear my guests say that. True hospitality is when you give your guests the best you’ve got. This means never expecting anything in return and always being there for your guests, whether you get paid or not. Luxury can be purchased, but genuine hospitality can only be given. Relationships with my guests are at the heart of everything I do, and their continued trust and loyalty has made my life complete. What does creating once-in-a-lifetime experiences for your guests involve? Extraordinary experiences come from the people you meet, not just the places you’ve been to. It’s these connections that can transform your life – nothing could be worth more. But it also means you have to pay close attention to every detail and leave nothing to chance. No request is too great or too daunting, from planning a formal dinner with Minton china, Baccarat crystal and show-stopping views, to exclusive box tickets for some of the greatest operas at the Metropolitan Opera House. If it’s legal, it’s done. Luxury is often defined by the smaller details, which I embrace as a perfectionist. I truly enjoy creating exclusive experiences that are as unique and extraordinary as my guests. What does the future hold for the Lauren Berger Collection? Do you have any plans to expand your current offering? 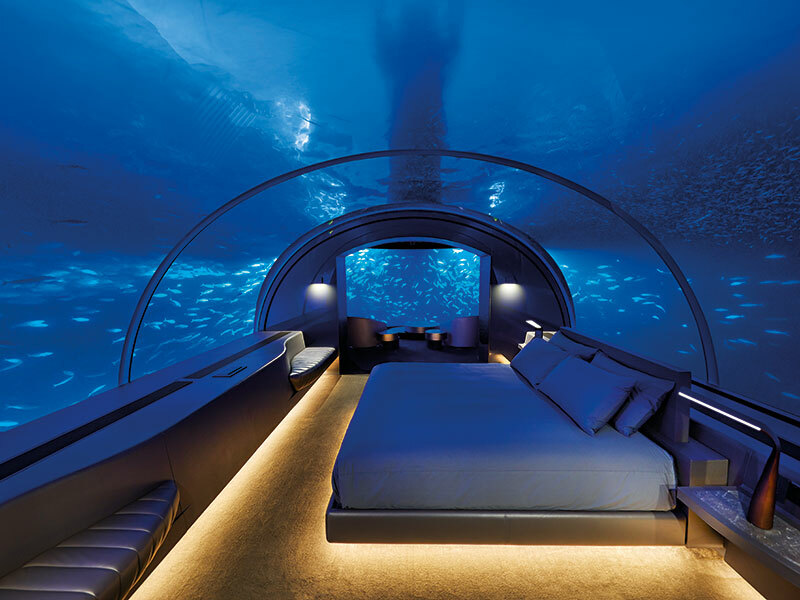 My ultimate dream would be to have a home big enough for all my guests to stay in at once. Until then, I plan to never give up and to continue searching for properties and experiences that will make my guests feel treasured. I do all I can to make sure the valuable time they spend with family and friends is nothing short of a lifetime memory. My guests have high standards and expect only the best, so I am very careful to ensure that no matter where I send them, the property owner provides the extreme level of hospitality they have become accustomed to with the Lauren Berger Collection. What advice do you have for entrepreneurs seeking to enter the hospitality industry? Hospitality, as with any business, should always focus on love – there’s no greater or more valuable motivating force. Of course, experience always matters, too. It’s the foundation for providing the most well-informed and discerning service. Every person appreciates being taken care of like family. When you truly love people, you can’t go wrong in hospitality. If I had only one day to live, I would be doing the same – taking care.